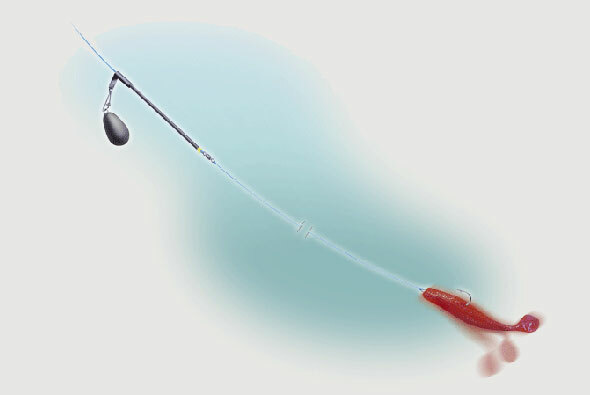 TRADITIONALLY ANGLERS DRIFTING wrecks and reefs using artificial sandeel lures would use a fl ying-collar rig, which incorporates a stiff wire boom to attach the long trace. These days the majority of anglers I see fishing wrecks use either soft shads or jellyworms, which can be worked off a more basic, but just as effective rig. The rig is a version of the running leger in its most simple form. You begin by sliding a long plastic tube boom onto a mono leader if you are fishing braid, but directly on to the mainline if not. The boom should be as long as possible, a 10-inch boom works exceptionally well and helps to reduce angles to a minimum. The boom not only carries the lead weight, which is hung from a snap link attached to the boom swivel, but keeps the lure streaming cleanly away in the tide when the rig is lowered down to the wreck. 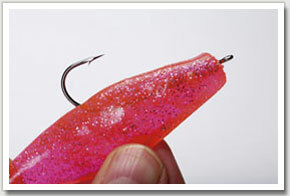 Following the boom, slide a small bead on to the leader to act as a buffer against the knot,. Then tie a tiny, but very strong, swivel at the end. 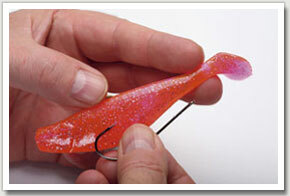 I use a Mustad size 6/0 and find bigger swivels have a negative impact on presentation. The trace line should be around 8-12 feet of good quality, limp, clear 20lb to 30lb mono; I use Amnesia. Many articles preach the virtues of tying a second swivel midway in the trace line to prevent tangles, but in my opinion this second swivel is entirely unnecessary and rather than prevent tangles, it causes them...however, it's your choice. Lead weight shape is critical for this style of fishing. It is essential you use a bomb-shaped sinker that will fall smoothly down through the water, again minimising the risk of tangles. Flat-bottomed leads tend to tumble and roll and will cause problems. The weight of lead will be dependent on water depth and the speed of drift, but 8-12oz is about right for most British wrecking situations I have encountered. Feed the needle-sharp hook through the jellyworm just like you would a natural worm. Try not to burst the hook out through the jelly. Aim to finish with the hook coming out a third of the way down the worm, with the head of the worm sitting firmly behind the hook eye. A jellyworm should last for up to six fish, after that they can look a little battle weary and should be changed. Once split and chewed they won't wobble so enticingly in the tide. 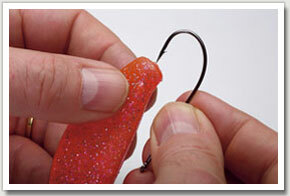 The hook size depends on size of lure, but must be needle-sharp and very strong. I favour Mustad 34042BLN Worm hooks; size 6/0 is a great starting point. The small barb ensures maximum penetration, while neat little shank barbs help secure a soft rubber lure in position. Storm shads come ready rigged with a perfect hook. The high quality, short-shank carp hooks are perfect for presenting a live eel. 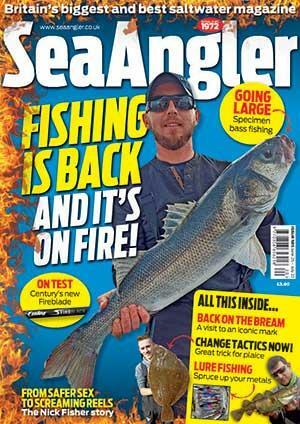 This is the definitive rig for presenting a shad, jellyworm or artificial sandeel over wrecks and reefs. It is also perfect for drifting a live sandeel. Typically deep and shallow water wrecks and reefs, but ideal for open ground fishing over sand banks with a live sandeel. Wrong - a bell lead with a flat bottom. Wrong - a watch lead.